Would you want to visit tropical penguins in their native habitat? Yes because penguins are friendly animals. Absolutely. Especially with my boyfriend who loves them. I'm glad he's an animal love like me. Have you been to in the Turkey before? Do you ever get out of the city? Do you ride dirt bikes or ATC's? What is your poison? Would you like to see Killarney Glen in Queensland, Australia? Who would you take? If they steal the rims off my car what can I do to get my car home? Which one of these European countries would you most want to visit? Not only them- there are penguins in Africa, South America and Oceania as well. But they live below the tropics. 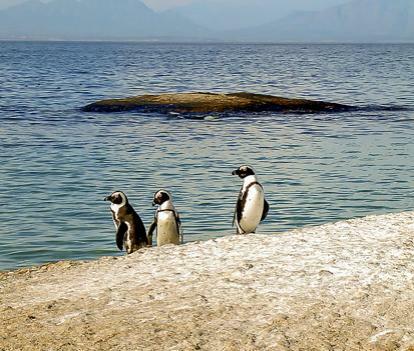 It would not be worth the freezing weather just to see penguins, when you could see them at the zoo. These are tropical penguins, not Antarctic ones. Never heard of such a thing! If so, and it was cheap to travel there, then yes. Yes sounds interesting. I am always curious about the world and how it works. I've always loved penguins, so that's a yes! Need to get to Cape Town ASAP. Yes! I love penguins! They are so cute and they waddle, it's hilarious. I'm ok, I'll just watch the pigeons, by the way why is pigeons spelled like this? In the Galapagos? That's also in my bucket list. The ones pictured above are off the coast of Namibia, but I am a huge fan of the Humboldt penguins in the Galapagos. Hmmm... Namibia sounds appealing too. We can also visit neighboring South Africa since we're in that southern section of the African continent already. OH MY!!! Look at those little buddies! Only if I can pet the penguins. Home > Travel & Leisure > Would you want to visit tropical penguins in their native habitat? Question for people who have traveled to the Eastern Caribbean?